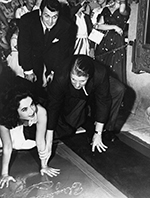 Graumanschinese.org / Forecourt Honorees / George Stevens, Elizabeth Taylor, Rock Hudson and "Giant"
Rock Hudson, Elizabeth Taylor and director George Stevens at Grauman's Chinese Theatre, Hollywood, California, Wednesday, September 26, 1956. One of Hollywood's biggest releases of 1956, Giant has, over the years, become one of classics of the 1950s. Based on Edna Ferber's novel from 1952 and produced on a lavish scale by the Warner Bros. studio with George Stevens both producing and directing, the film lived up to its name in every way. Although, as was the custom, Giant had its world premiere at the Roxy Theatre in New York, the "Hollywood Invitational Premiere" a week later was one of the biggest events held at the Chinese. Sensing a huge hit, the top three Giant figures were asked to make their impressions on a single, appropriately gigantic block several days ahead of the Hollywood premiere. Grauman's Chinese Theatre, Hollywood, California. Giant footprint block. Executed by John Tartaglia, Wednesday, September 26, 1956. 98 x 61 inches. George Stevens at the 29th Academy Awards, held at the RKO Pantages Theatre, Hollywood, California, Wednesday, March 27, 1957. George Stevens is considered one of the top directors making films during Hollywood's golden age. Driven to make films in as many genres as possible, he was responsible for massive hits in almost every type of film he set his hand to. Both of Stevens' parents were actors. A theatrical approach became a highly influential aspect of his films. When Stevens went to Hollywood, he found work as a cameraman with Hal Roach and his comedy team Laurel and Hardy, who also had a predeliction for long takes and the slow payoff to comedy. Graduating to the director's chair in 1930, Stevens eventually became a power at the R-K-O studio where he directed such films as Alice Adams (released in August, 1935), Swing Time (released in August, 1936), and Gunga Din (released in February, 1939). During World War II, Stevens served with the Signal Corps, where his unit photographed the D-Day Normandy Invasion, and the liberation of Paris. His units' footage of the Dachau Concentration camp was used as evedence at the Nuremberg Trials. After the war, Stevens' was able to select his projects and produce them for whatever studio he wished to work with. His films acquired a somewhat more serious tone, beginning with I Remember Mama (released in March, 1948). Stevens really hit his stride in the 1950s with A Place in the Sun (released in August, in 1951), Shane (which played the Chinese in June, 1953), Giant (played the Chinese in October, 1956) and The Diary of Anne Frank (released in March, 1959). He joined the widescreen epic trend with the disappointing The Greatest Story Ever Told (released in February, 1965, and hung up his spurs after 1970's The Only Game in Town. He died in 1975 at the age of 70. 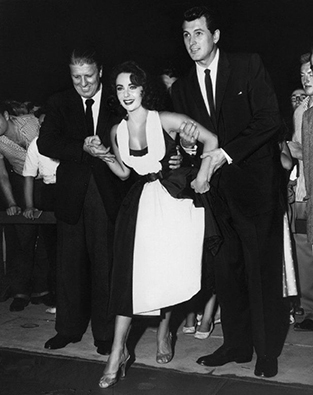 Giant director George Stevens and co-stars Elizabeth Taylor and Rock Hudson at Grauman's Chinese Theatre, Hollywood, California, Wednesday, September 26, 1956. 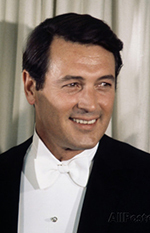 Rock Hudson, in the late 1950s and 1960s, became the very definition of the words "movie star." His physical presence and personality brought him great success, although critics considered him to be a lightweight. Fortune may favor the bold, but Rock Hudson's secret life and his final struggle with AIDS has been a source of inspiration and reflection to many around the world. Growing up as a shy sort of kid, Roy became interested in theatre by working as an usher at the local movie house. He was drafted after high school, where he served as a Navy mechanic in the Philippines. After his discharge, he settled in Los Angeles. Agent Henry Willson signed the strapping lad up, changing his name to Rock Hudson. 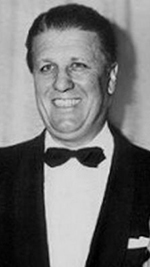 Rock was given a contract at Universal, where he was given acting lessons. Director Douglas Sirk mentored the actor, eventually giving him the lead in his romantic adaptation of Magnificent Obsession (released in August, 1954). Giant (played the Chinese in October, 1956) put him firmly in the front ranks of bankable actors, but he turned down several plum roles in order to appear in David O. Selznick's last film, A Farewell to Arms (which played the Chinese in December, 1957). The early 1960s saw Hudson specializing in lighthearted comedies: Pillow Talk (released in October, 1959), Lover Come Back (released in March, 1961, and Man's Favorite Sport? (released in January, 1964), but later in the decade, he branched out into action/adventure roles, such as Seconds (released in May, 1966), Tobruk (released in February, 1967), and Ice Station Zebra (released in October, 1968). 1971 saw the debut of his television series McMillian & Wife, which ran for six years. His career became spotty after suffering a heart attack in 1981. Diagnosed with AIDS in 1984, his rapid physical deterioration shocked many, while the slow revelation of his personal life caused public officials and private citizens alike to re-evaluate their attitudes toward gays and the AIDS epidemic. He was 59 when he passed away. 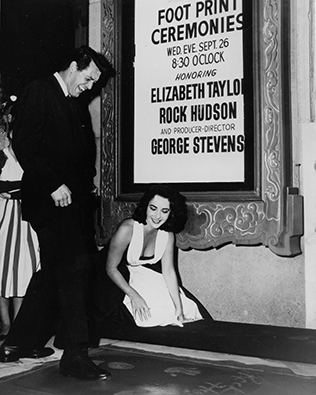 Giant co-stars Rock Hudson and Elizabeth Taylor at Grauman's Chinese Theatre, Hollywood, California, Wednesday, September 26, 1956. Elizabeth Taylor was probably the most famous movie star in the world for most of her life. Appearing in major roles in films by age 12; widely considered the most beautiful and desireable woman in the world by age 20, Taylor followed her instincts and became universally acknowledged as a great actress by the time she was 35. Born to wealthy parents living in London, the family moved to Los Angeles in 1939, where Liz landed a contracct with Universal. Moving to M-G-M, her performance in the film National Velvet (released in January, 1944) made her an instant star. When a young woman, she starred in Father of the Bride) released in June, 1950, and became the woman Montgomery Clift would kill for in George Stevens' film A Place in the Sun (released in August, 1951). Taylor wanted to expand her talents and appear in films she could proud of. This desire led her to be cast in Giant (played the Chinese in October, 1956), which was such a big hit that finding the proper follow-up was difficult. She appeared in the films of Tennessee Williams' Cat on a Hot Tin Roof (released in September, 1958) and Suddenly, Last Summer (released in December, 1959), but a film she contractually owed M-G-M, BUtterfield 8 (released in November, 1960), she loathed, despite winning the Oscar for Best Actress for it from her hospital bed. Playing the title role in 20th Century-Fox's Cleopatra (released in June, 1963) brought her into contact with Richard Burton, with whom she made several films, most notably Who's Afraid of Virginia Woolf? (released in June, 1966), and an adaptation of The Taming of the Shrew (released in March, 1967). She and Burton had a tempestuous marriage together — one of eight for Taylor. Reducing her film roles later in life, Taylor nonetheless fascinated the world's press; she used this attention to promote a number of causes, most notably AIDS research, doubless in tribute to Mr. Hudson, her co-star from Giant. Taylor died of congestive heart failure in 2011, aged 79. 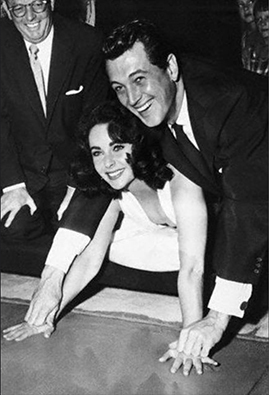 Giant co-stars Elizabeth Taylor and Rock Hudson at Grauman's Chinese Theatre, Hollywood, California, Wednesday, September 26, 1956.